Also known as Posterior vitreous detachment (PVD). The vitreous humor extends from our natural lens to the retina, pushing the retina against the choroid. It is attached to the retina via millions of fine fibers. During the aging process, the vitreous shrinks and develops pockets of liquefaction. As it shrinks, the fibers pull on the retina. Normally, the fibers break, allowing the vitreous to detach away from the retina. 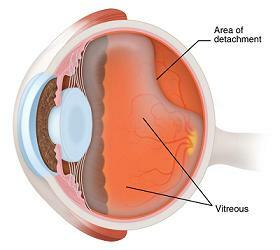 Vitreous detachment is usually not sight threatening and requires no medical attention. However, it is possible that the vitreous fibers are pulled so hard that a tear or hole is created in the retina or macula. In some serious cases, a retinal detachment or macular hole may occur. Both these conditions are sight threatening and should be looked into immediately. Flashes of light and sudden increase of floaters may be caused by the blood leakage of the retinal tear. Therefore it is important to get your eyes checked if you notices them. No treatment or therapy is required as it is a natural aging process. But retinal tear/detachment and macular hole can cause permanent sight loss, therefore great caution must be taken if any of the symptoms listed above occurs. For the floaters, as you grow older the vitreous becomes more liquefied and floaters will become less noticeable. In the event where the floaters persisted and is affecting important activities such as driving or reading, then surgery to remove them can be considered. However, there are several potential complications associated with vitrectomy such as early development of cataract. retinal detachment and infection. It is important that the floaters are significant and are severely impairing your activities. There are no prevention methods known today as the liquefying of vitreous is a natural aging process. However, there are some school of thoughts which believe that adding antioxidants to your diet can help to preserve the integrity of the vitreous by reducing free radicals. You may want to consider taking eye vitamins, as it is quite difficult to get sufficient nutrients in our dietary habits today.